Today I went out to buy Twilight: New Moon....I know some people say they ruined vampires and made them stupid....I personally like the love story/two guys fighting over the girl....I am a gamer....I don't always like the pretty stuff....but I want to see the movie. :P If you think it's dumb then that is cool...you have your own taste which is why you are YOU and I am ME. 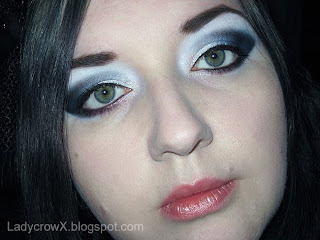 Anyway I decided to do a GDE look today since I got the set of Twi-Shadows that @veeglamour made. I was especially excited to try out Mind Reader which is a gorgeous matte navy blue (almost black) with silver sparkles in it. 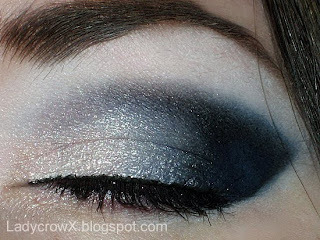 I will post swatches of the shadows in a later post (off to watch New Moon) but for now here is the Twilight look of the day.